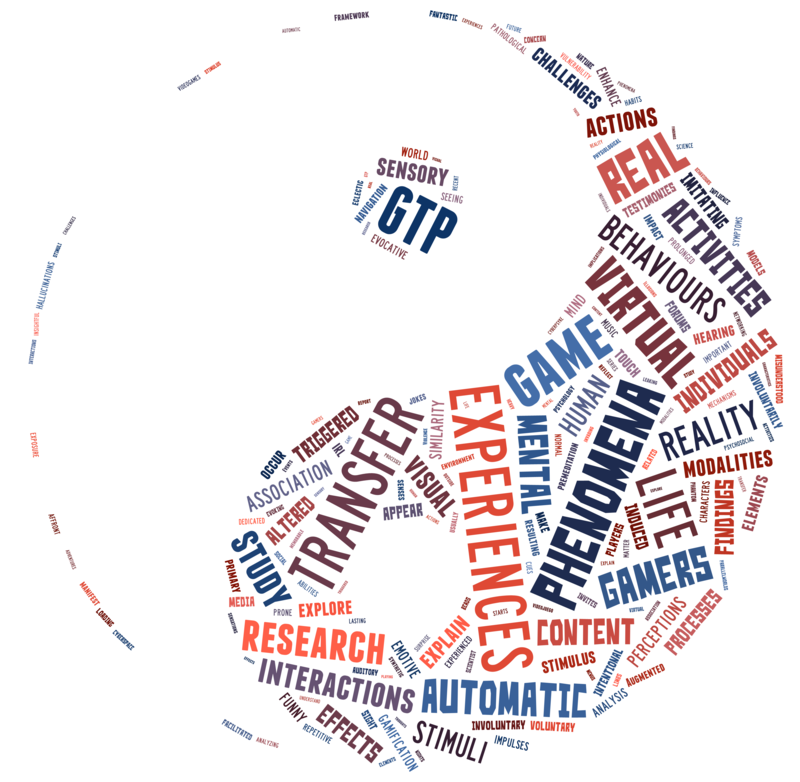 GTP is the transfer of experiences from the virtual to the physical world that comprise sensorial, perceptual, cognitive, and behavioural changes or intrusions in direct relationship to video game content/features, experiences during playing (e.g. immersion, embodiment), and game-related hardware/peripherals (e.g. gamepads). Demystifying, explaining and raising awareness about Game Transfer Phenomena to encourage healthy and safe video game playing. Contributing to the understanding of involuntary phenomena relevant for several scientific disciplines. Reducing the stigma of mental disorders and video game playing. To understand the relationship between involuntary phenomena (e.g., sensory distortions/intrusions, spontaneous thoughts, urges and behaviours) and video games’ structural characteristics including the interaction with game-related hardware. To understand both the individual impact but also the potential uses of GTP. • Identifying and defining the forms of GTP, and their characteristics. Video games have become a matter of emotional touch, evoking not just sensations but lasting emotive imprints, which hold many of the same characteristics of memorable real-life experiences. Do you want to share you Game Tranfer Phenomena experience in a podcast? A recognised American podcast wants to hear your voice! If you would like to share, please contact me. Involuntary phenomena are part of our everyday lives, even when we don’t notice them; however, when these phenomena manifest recurrently, and with particular contents, they can become intrusive and distressful, and in extreme cases lead to serious mental illness (Angelica, 2016). We play a lot… We of the silicon generation live in a pseudo, near constant hypnagogic state. A lucid threshold consciousness in which the vibrancies of the gamerverse shift into reality, pulling us in and out of the slipstream. When I put my controller down, and step outside into the bright cloudless sky, I can see screen-tearing, pixelation. Are these augmented realities not my realities? Am I still playing a game? The GTP project started as my Master research thesis at Stockholm University in Sweden in April 2010 supervised by professor Karin Aronsson, followed up with my PhD on GTP at Nottingham Trent University in UK supervised by professor Mark D. Griffiths, “Exploring Game Transfer Phenomena: A multimodal research approach for investigating video games’ effects”. Currently, I’m researching about GTP as my Postdoc funded by a Marie Curie fellowship at the University of Liège in Belgium with my mentor professor Frank Larøi.